PHILADELPHIA -- Picked by many to win the NFC East, the New York Giants desperately need to win one game first. Nobody in Philadelphia sympathizes with them. Eli Manning, Odell Beckham Jr. and the slumping Giants (0-2) face the Eagles (1-1) in their home opener on Sunday. A hostile crowd at the Linc awaits them. "We're going to try and make sure that they don't get it worked out against us," Philadelphia defensive end Brandon Graham said. The Giants are coming off a 24-10 home loss to Detroit on Monday night, the eighth straight game their offense hasn't scored 20 points. Coach Ben McAdoo, who led New York to an 11-5 record and the playoffs in his first season, is already feeling the heat. His playcalling has been questioned and he's considering relinquishing those duties. "I don't think it's the playcalling that's been the problem," Manning said. "I think it's the execution. You've just got to believe that going through tough times will make you stronger. But you've got to get through them. That's kind of the situation we're in. There's always going to be ups and downs of a season. Hopefully, we've kind of hit the rough patch and we'll work ourselves out of it." The Eagles won their season opener at Washington and surrendered a lead in a 27-20 loss at Kansas City last week. They're improved and eager to go 2-0 in the division. But they're not good enough to be overconfident against any opponent. 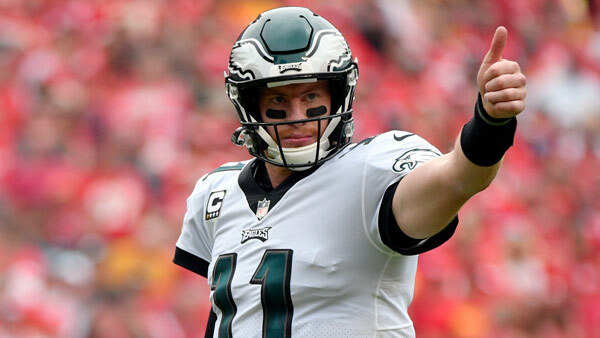 "They're a good football team," quarterback Carson Wentz said. "Yeah, they're 0-2, but they are a good football team. They were a good football team last year and they're very similar to last year. We can't by any means overlook them because they're 0-2." The Giants still have a formidable defense led by coordinator Steve Spagnuolo and several talented players, including Jason Pierre-Paul, Olivier Vernon and Landon Collins. If the offense can stay on the field to keep the defense fresh, New York will be tough. Beckham has been slowed by injury and could be primed for a breakout game against Philadelphia's banged-up secondary that could be missing two starters. Cornerback Ronald Darby is out and safety Rodney McLeod has a hamstring injury. "He's a very difficult player to handle, and their offense has missed him the first couple weeks," Eagles defensive coordinator Jim Schwartz said of Beckham. "It's our job to keep him from being a game-changing factor. It's going to take good team defense to do it. It's not going to be one guy that'll do it." CATCHING THE BALL: Neither team runs much, so expect to see a heavy dose of passing. New York has Beckham, Brandon Marshall, Sterling Shepard and rookie tight end Evan Engram. The Eagles have Alshon Jeffery, Torrey Smith, Nelson Agholor, Mack Hollins and tight end Zach Ertz. That's a talented group of receivers who should see plenty of passes coming their way. O-LINE ISSUES: Both teams are having issues with their offensive lines. The Eagles are making a switch at left guard, benching Isaac Seumalo for Chance Warmack. But the Giants are sticking with left tackle Ereck Flowers despite his struggles. They might have to make a move because Justin Pugh went from left guard to right tackle on the opening series against Detroit after Bobby Hart aggravated an ankle injury. NO RUN GAME: The Giants are last in the NFL in rushing and the Eagles are 20th. Neither team has an obvious No. 1 back. LeGarrette Blount led Philadelphia with 14 carries for 46 yards in Week 1, but didn't get a carry last week while 34-year-old Darren Sproles ran 10 times. Wentz leads the Eagles with 61 yards rushing. Paul Perkins, Shane Vereen and Orleans Darkwa have shared the running duties for New York. SACK ATTACK: The Eagles are bringing the heat through two games with eight sacks. But they've also allowed eight. So has New York. Manning was harassed so much by the Lions he went down once without even getting hit. Both quarterbacks should face plenty of pressure. SPECIAL TEAMS: Rookie kicker Jake Elliott missed a 30-yard field goal in Philadelphia's loss to the Chiefs and veteran Sproles fumbled a punt that led to a short touchdown drive. Meanwhile, the Giants allowed an 88-yard punt return for a score in the loss to Detroit.